Vienna Pass: Advantages and disadvantages. Buying the Vienna Pass? The Vienna Pass is a ticket for tourists which is valid for 1 day or more. 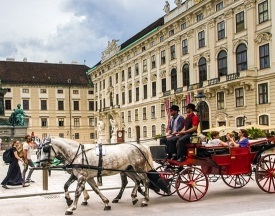 Holders can use the frequent buses of „Vienna Sightseeing“ between the sights for free and have free admission to many important sights in Vienna (over 60 museums and other attractions). With some attractions, you even save the queuing at the often long queues at the cash desk. We recommend buying the pass on the Internet before your trip to Vienna. In our opinion the best option is to buy the Vienna Pass on the website Getyourguide. There you can also cancel up to 24 hours before the trip for free. For whom is the Vienna Pass worthwhile? The Ticket Vienna Pass is intended for city tourists in Vienna who want to visit many of Vienna’s great sights in a few days. The entrance fees in Vienna are quite high, with the Vienna Pass you can really save money. This is especially true for people who want to see many big attractions with higher entrance fees. Many sights cost 10 Euro or much more without the Vienna Pass. 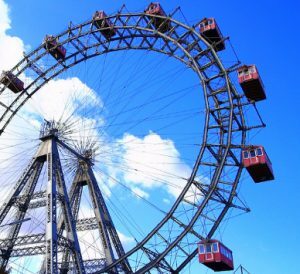 Examples are the Hofreitschule Vienna, the Hofburg, the wax museum Madame Tussauds, the famous Giant Ferris Wheel, the great Vienna Zoo, Schönbrunn Palace, the Albertina, the famous Kunsthistorisches Museum Vienna and much more. 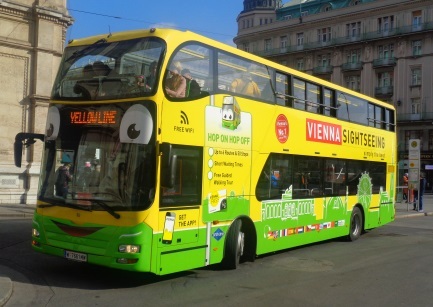 There are also free buses from „Vienna Sightseeing“. Important: The Vienna Pass is especially worthwhile if you want to see a lot in Vienna in a few days. What are the advantages of the Vienna Pass? – It should not be underestimated that with the passport for Vienna, one often does not have to queue at the cash desks. This is not true for all attractions, but for some important sights. – The sightseeing buses run very frequently and have several lines. The buses go directly to the sights. You don’t have to find your way around public transport yourself. In addition, the subways, trams, etc. often do not stop directly at the sights, but the sightseeing buses do. – Once you have the Vienna Pass, you can see a lot for free and simply enjoy your trip to Vienna. It’s definitely a great feeling to pass the queue of sights for free while others are waiting and paying. – You get a useful app for your smartphone and a city map for the Vienna Pass. In addition, you will be informed about the next sight in the buses. – Good rating on the Internet: On rating portals, in forums etc. you will only find a few comments from people who have regretted the purchase of the Vienna Pass afterwards. The vast majority is very happy with the Vienna Pass. What are the disadvantages of the Vienna Pass? That reminds us of one thing above all else. The Vienna Pass is not quite cheap. You have to look at some big sights every day. In any case, sightseeing should be the main focus of the Vienna trip, so that the pass is worthwhile. The pass is suitable for holidaymakers who stay a few days in Vienna. For people who want to stay a few weeks and watch the great things in Vienna slowly, the ticket is less suitable. The Hop-On-Hop-Off buses can be used as long and as often as you want during the validity of the pass. The following sights can be visited free of charge with the Vienna Pass. – Vienna Zoo: Next to Schönbrunn Palace. The oldest zoo in the world and one of the most beautiful zoos in Europe, normally costs 18.50 euros admission. You don’t have to queue at the ticket office at Schönbrunn Zoo, you can go straight to the entrance with the Vienna Pass (ticket without queuing or in new German: Skip-the-line-Ticket or Fast-Track-Ticket). – Weltmuseum Wien: One of the best ethnological museums in Europe, very large, costs 12 Euro entrance fee. – the famous wax museum Wien Madame Tussauds Prater Vienna (usually over 20 Euro). It is a well-known branch of the London Wax Museum Cabinet. – the Vienna Giant Ferris Wheel, also in the amusement park Prater (about 10 Euro), with the Vienna Pass at the Prater Giant Ferris Wheel you don’t have to queue at the cash desk, so you can often save a lot of time. – Schubert’s birthplace, Schubert’s dying house, the Mozarthaus (where Mozart lived for a few years, also called Mozart’s apartment), the Haydnhaus, the Beethoven Haus, Johann Strauss’s apartment, etc., most of these „musician’s attractions“ cost 5 to 12 euros each. Many are in the centre of Vienna and you happen to pass by. – Kaiserliche Wagenburg: Great museum carriages etc. – another at least 10 exciting museums and similar like Globe Museum and Esperadomuseum, Papyrus Museum, Literature Museum, Imperial Furniture Collection (furniture museum), Kunsthalle Wien (very well known), Kunst-Haus Wien (Hundertwasser), Museum für angewandte Kunst Wien, Kaiserkruft in der Kaputzinerkirche, Jewish Museum Wien, Verkehrsmuseum (public transport museum, we liked it very much), Pathological and anatomical collection, hall of the National Library, Josephinum (medical museum at the University of Vienna), Prater Museum etc. Most of these museums cost a normal entrance fee of 5 to 10 Euros. These are not all attractions that can be visited for free with the Vienna Pass. If you want to see a lot, with the Vienna Pass you can save a lot of money!